Levent Kulaçoglu is one of the most active members of our community and an expert in AppSheet. Based in Istanbul, Turkey, he's currently the Project Director for one of the largest construction projects in Europe. He's been developing apps with AppSheet to serve all kinds of purposes, such as financial modeling or recording training activities in his motorcycle club. To date, however, his most successful app was one he designed to help his wife, a cardiovascular surgeon, keep track of her hospital's scheduled surgeries. Levent's wife is responsible for scheduling all cardiovascular surgeries and distributing the surgery schedule to her colleagues on a daily basis. As she is very busy each day performing surgeries, conducting intensive care unit visits, and seeing patients, she was sending the list to Levent via WhatsApp, who was then writing the schedule to an Excel sheet and then e-mailing the schedule back to her as PDF document. As a Project Director, Levent is also quite busy, so this was a time-consuming process! Levent found AppSheet and decided to try his hand at creating a mobile app for his wife's scheduling needs. He constructed a Google Sheet, added a few features like workflow emails and time-triggered scripts, and was surprised to find "within a couple of hours it was working. Voila!!!" He hadn't realized he could create a working mobile app to solve his wife's scheduling issues all on his own, and within a day or less. Levent's wife has been using the app every day for about five months. It's now the hospital's primary cardiovascular surgery scheduling system. Says Levent, "she is extremely happy with it because she can do the scheduling work in five minutes-- even during a coffee break." Levent has bigger plans for the app, too. The hospital is currently using a Hospital Management Software called Nucleus. Levent has negotiated with both the hospital's CEO and the software developers to implement a very small part of this system-- post-op diagnostic results of the patients-- with AppSheet. 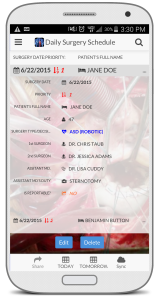 This will open up the app to other surgeons as well, allowing them a more comprehensive, interactive role with the scheduling app Levent developed with AppSheet.